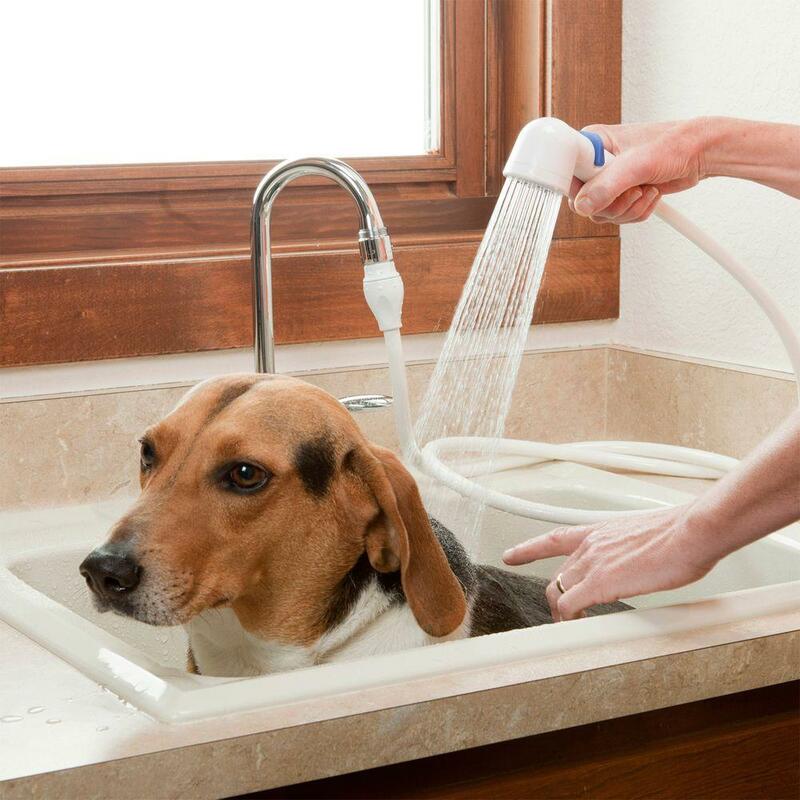 Giving a bath to your favorite dog in a bathtub isn't easy, these dog washing gadgets make things a lot easy for you and your dog. BarkBath Portable Dog Bath System: The BarkBath Portable Dog Bath System is a portable bathing system that lets one bathe their dog practically anywhere and anytime with virtually no mess. It features specially designed nozzles that let water and shampoo to reach beneath the fur and down to the skin and wash the skin clean. And the dirty water gets sucked back into a separate water tank. Buy Now. 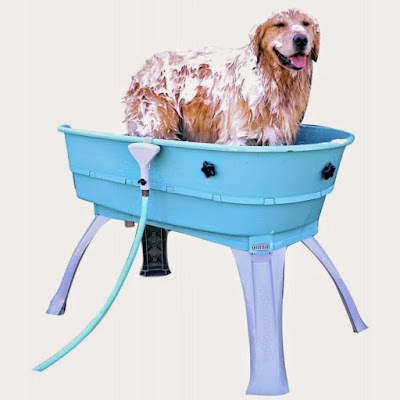 Booster Bath Elevated Dog Wash Tub: This elevated dog washtub provides a 360-degree access for easy bathing and drying the dog while one stays dry. Buy Now. Petscrub: The Petscrub is a waterless dog bath system that removes dirt, sand, and mud, and keeps your dog's coat healthy and shiny. It keeps your dog clean and smelling fresh all month long, it eliminates any need for setup or cleanup, and is easy to store, so no more mess of water, mud, and hair in your bathroom. Buy Now. 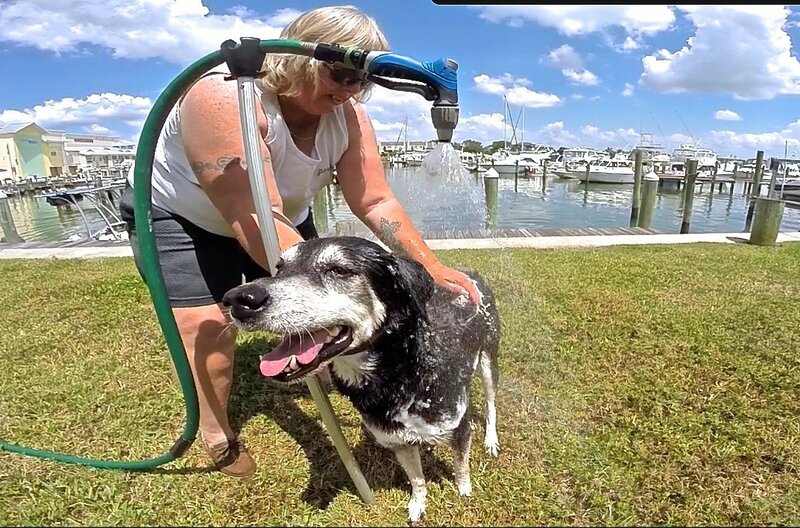 Woof Washer 360: The Woof Washer 360 cleans your dog in under a minute. All you need to do is connect it to your garden hose, pour shampoo in, slip the hoop over your dog and turn on. The shampoo mixes with water and creates a sudsy solution to scrub your dog clean, from head to tail and your dog will be shampooed and rinsed in under one minute. Buy Now. 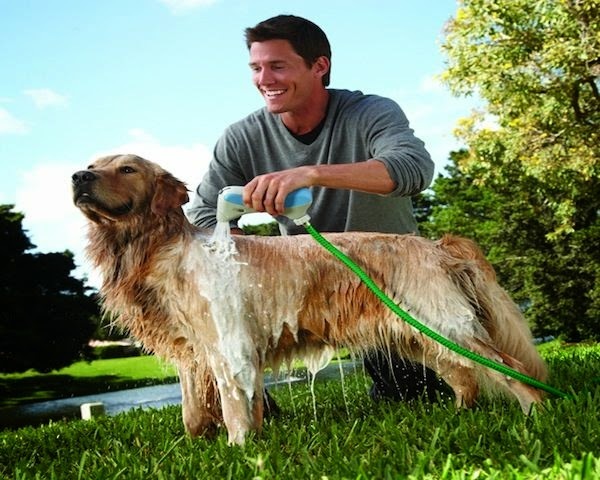 Bathe N' Groom Indoor Outdoor Dog Washer and Dog Grooming System: The Bathe 'N Groom Pet Shower cleans your dog from root to its outer coat. It cleans dogs with long hair, short hair, thick hair, and even curly hair. This all-in-one brush combs and washes at the same time for deeper cleaning. It comes with four-foot hose, three connectors, and soap reservoir for multiple washings. Buy Now. 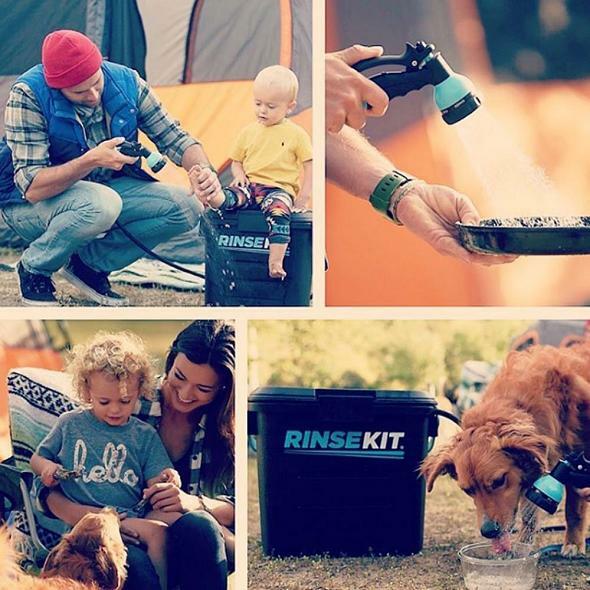 Rinse Kit Portable Shower: The Rinse Kit Portable Shower is a pressure system that holds up to 2 gallons of water with a spray nozzle that provides different settings from jet stream to soaking shower making that lasts for up to three minutes; its perfect for camping, outdoors and a muddy dog walk too. Buy Now. Washbasin Faucet Rinser: The Washbasin Faucet Rinser securely attaches to your existing faucet and makes it easy for you to wash your dog. Buy Now. 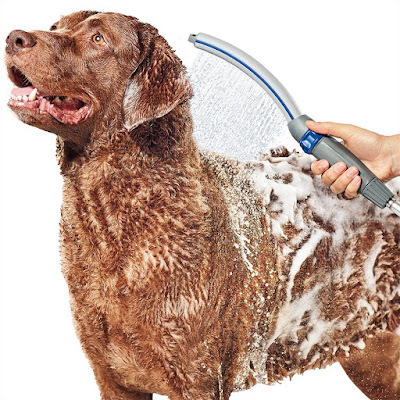 Dog Travel Shower: The Kurgo Mud Dog Shower is perfect for those times when your four legged buddy had a playful day in mud and needs to be cleaned up instantly before you take him home. The Dog Travel Shower attaches to a plastic soda bottle and turns it into a portable shower. 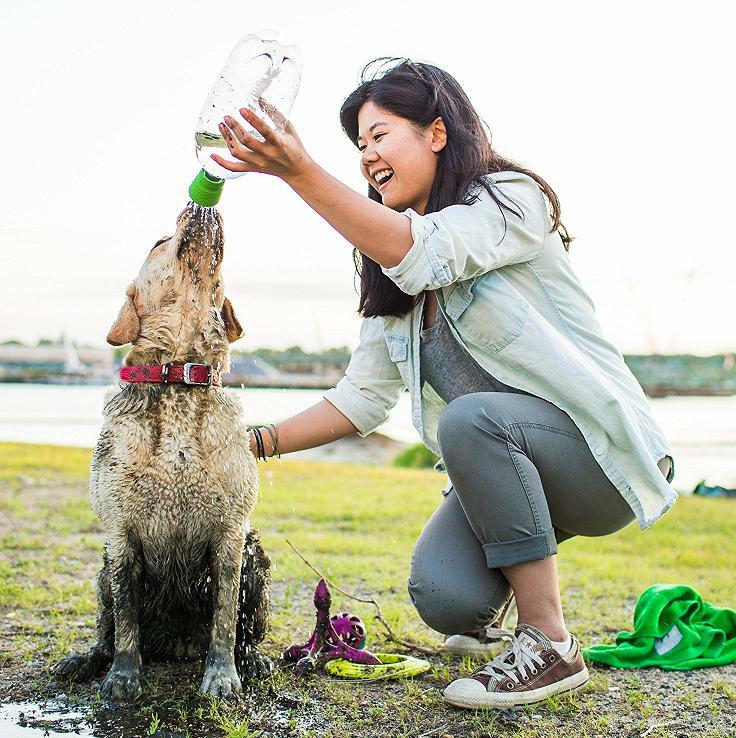 It gives an instant flow of water that can clean your muddied dog. Buy Now. 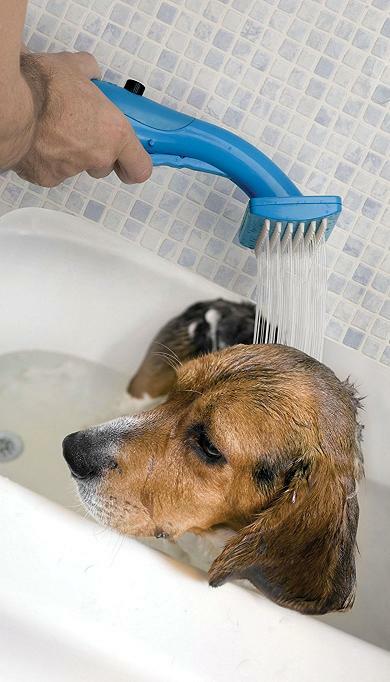 Waterpik Dog Shower: The Waterpik Dog Shower provides full-coverage water comb spray for maximum cleaning power of thick fur and its unique contoured shape is designed to wash dogs of all sizes and types. It can be used indoors and outdoors and comes with extra-long 8-foot flexible hose for extended reach and variable water flow. Buy Now. 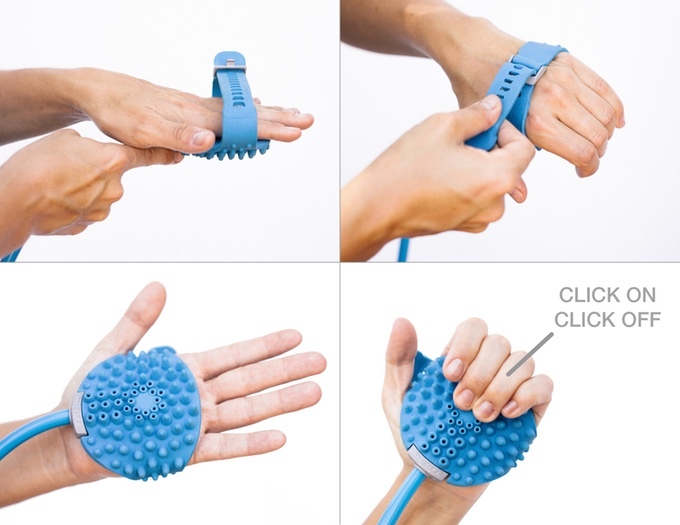 Aquapaw: Aquapaw looks like a shower glove that's designed for your best friend. This patent-pending device combines water sprayer and bath scrubber in one unit. You can turn on and off this wearable sprayer/scrubber combination by closing your palm. 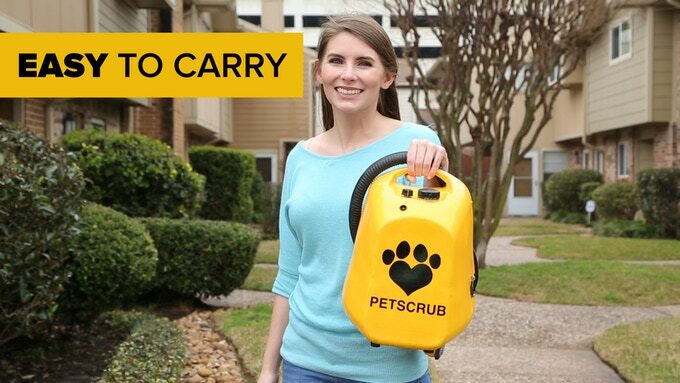 It lets you control your dog and the flow of water while you clean your best friend. Buy Now. 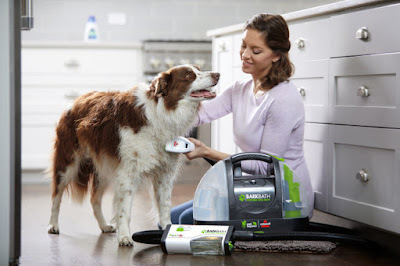 Hydrosurge Rapidbath For Dogs: The Hydrosurge Rapidbath combines washing and shampooing processes into one and makes bathing up to 70 percent faster while cleaning thickest coat right down to the skin. Buy Now. 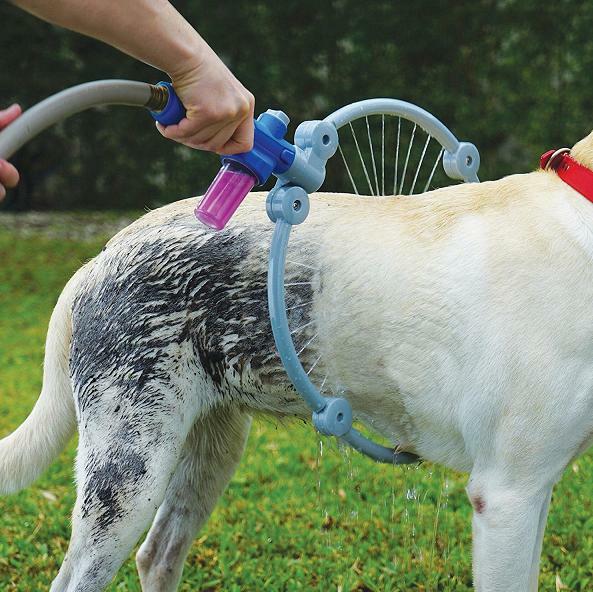 Hosehooker: The Hosehooker makes it really easy for you to give your dog bath outdoors. Buy Now.